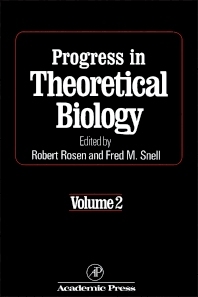 Progress in Theoretical Biology, Volume 2, brings together the significant and timely theoretical developments in particular areas of biology in a critical and synthetic manner. It is concerned with a field which has emerged as an identifiable subdiscipline of the biological sciences. This emergence and recognition signify that biological science has evolved from its initial stage of description and classification into the adolescence of transformation to the quantitative. The book's opening chapter develops a theory that uses a new generalization of statistical mechanics to provide a basis for understanding how the microscopic behavior of nonliving parts can generate the macroscopic appearance of a living aggregate. The subsequent chapters discuss theoretical methods in systematic and evolutionary studies; the theory of neural masses; the design of chemical reaction systems; cooperative processes in biological systems; and the organization of motor systems. This book is intended for the modern biological scientist as well as for the physical scientist who is inquisitive of the ways of the most complex of all processes.